After much anticipation, on July 6, Niantic released a beta version of Pokémon GO – a mobile game that has since entranced an estimate of around 10 million daily players. In only a few weeks, this game has inspired nostalgia and engaged Pokemon fans of all ages. As one can imagine, the game’s explosive popularity caused Nintendo’s stock to more than double (although, it is unclear how long this will last). The game employs a modest dose of augmented reality technology. 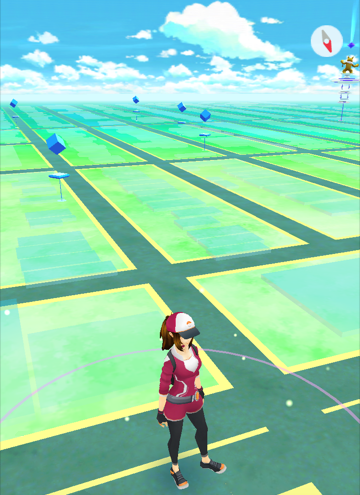 In essence, the objective of the game is to “catch ‘em all.” Smartphones in tow, players must physically travel outside their homes and into their communities to find these elusive creatures, collect resources, battle, and capture “gyms.” When a player spots a Pokemon, the creature actually appears IRL (“in real life”) through the smartphone camera. Pokémon GO has sparked intense reactions from active users, and judgmental spectators, on a wide variety of social, cultural, economic, and legal issues. On one hand, many are incredibly enthused that gamers are forced to go outside, explore their communities, and interact with the “real world.” However, to what extent are players really interacting with reality? One can usually spot a Pokémon GO user because their gaze is intensely fixated on their phone (and not on their surroundings). There are also many lowlights to the game’s release, such as accidents caused by distracted drivers (and distracted pedestrians). From our perspective, Pokémon GO implicates several legal issues relevant to our current and prospective clients: does the camera feature invoke issues related to privacy rights? Do Niantic’s policies adequately protect users’ personally identifying information? Could Niantic be liable for tort claims deriving from Pokémon GO accidents? These are simply a few of the issues implicated by Pokémon GO and similar apps. Stay tuned to blog.muddlawoffices.com as we continue to catch all of the practical and legal implications of the cultural phenomenon that is Pokémon GO.